This is the place to memorialize those candies that are no longer with us…. 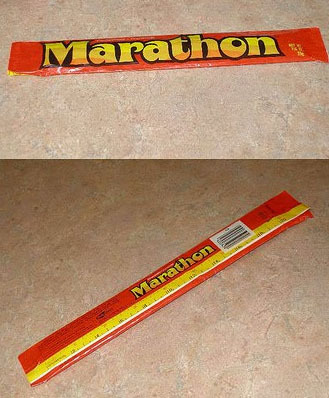 Let us not forget the Marathon Bar. Almost a foot of chocolate-covered, braided candy. It was so good. There was a ruler on the back of the package so you could measure your calorie intake by the inch. Although it has been discontinued, Cardbury’s Curly Wurly is an adequate substitute. You can find the Curly Wurly where imported candies are sold. 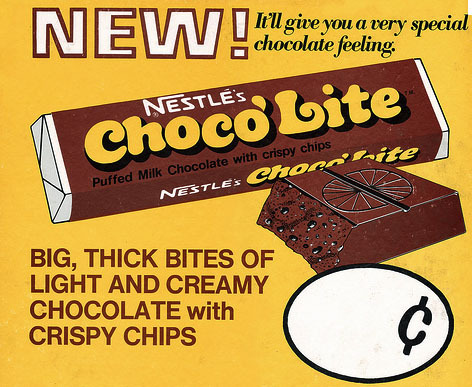 Next we miss the delicious Choco’lite Bar of the 1970’s. It was whipped chocolate filled with tiny air holes. It crunched when you bit into it, and was feather-light, thus the “lite” in its name. Luckily, Cabury comes through again with the Flake. A candy bar very similar to the Choco’lite. The Brits truly appreciate their candy, and I thank them for that! These were candy coated disks, about 4 times as big as an m&m. They were half peanut butter and half chocolate, and really good. The best equivalent these days is the peanut butter m&m. 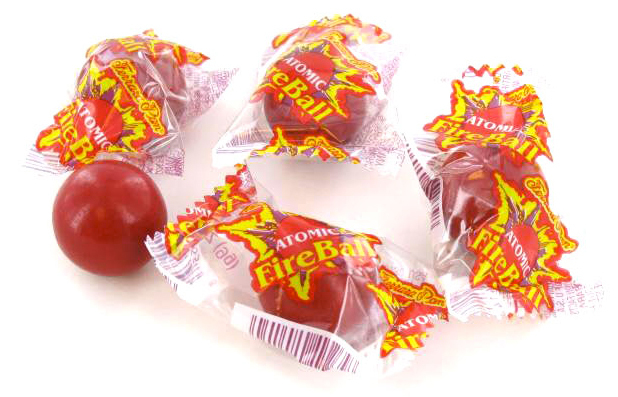 The creator of the “atomic fireball” passed away on 2/8/2012. I want to thank him for inventing such an iconic and addicting candy. I will think of him each time I feel that cinnamon burn in my mouth….seriously, I think I’m addicted. For more information on vintage candy, please visit Collectingcandy.com , this is where I found the images of the Chocolite and Marathon bars. So glad you liked it! As you can tell. candy is a favorite topic with me. My family doesn’t understand…. Atomic Fireballs are my favorite too, especially on road trips. So glad that you like the blog!